Though we live in Maryland, we rarely eat crab cakes. I don’t particularly care to order them from restaurants because the crab to filler ratio is poor and they can be quite expensive. 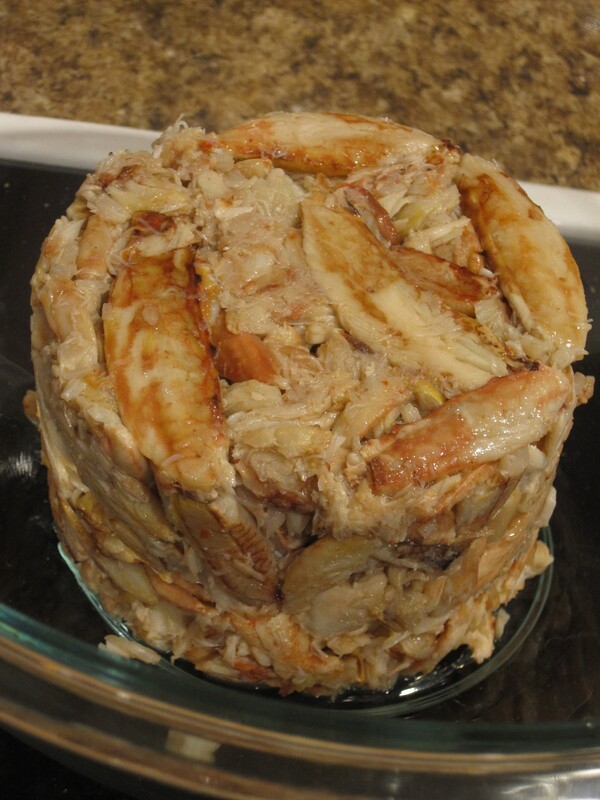 Well, luckily, crab cakes are relatively easy to make and when you can get crab meat on sale it can actually be quite inexpensive. Such was the case when Greg found crab meat on sale at the Teeter. On the back of the can was a crab cake recipe from Phillips. We decided to use that as our base, but also spice things up and use some ingredients we had in the house. 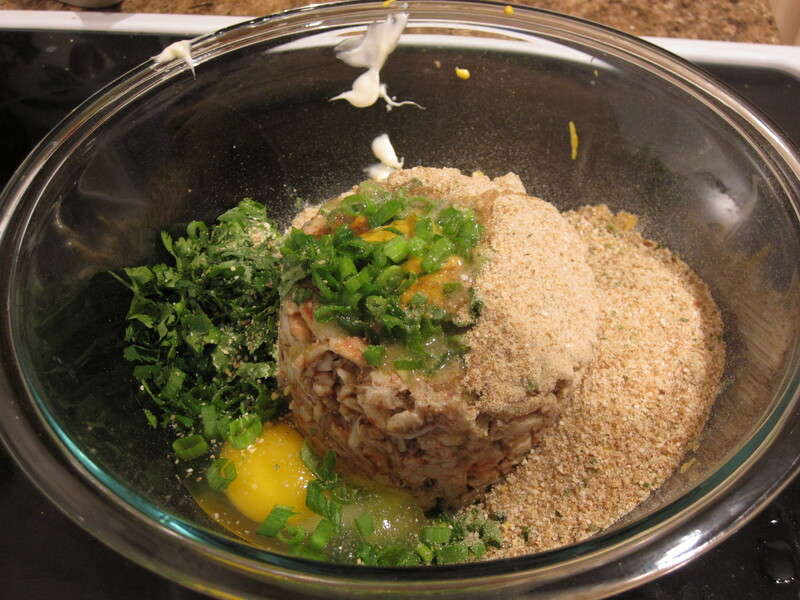 We added jalapeno and green onion for some extra kick and used cilantro instead of parsley. 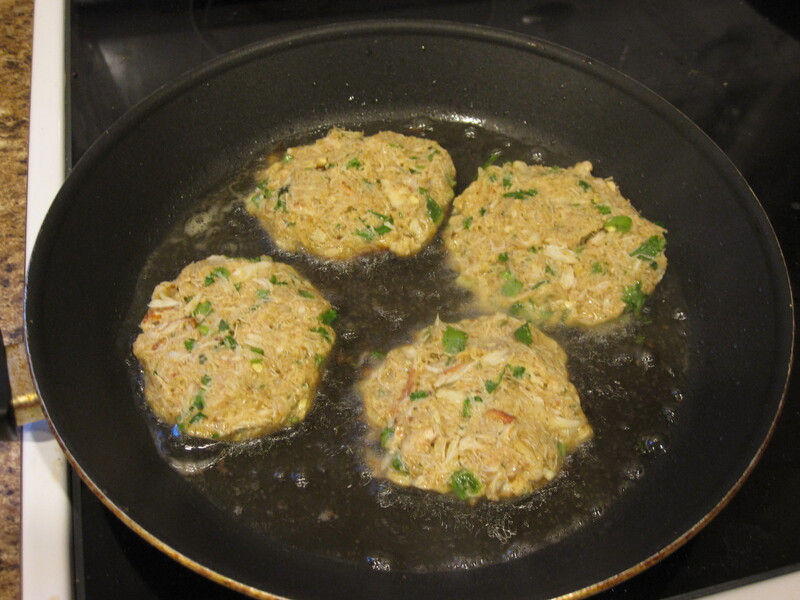 Greg originally wanted to call these ‘green crab cakes’ because of all the green ingredients we added. I was unsure about calling a seafood dish green though, but the name works once in the right context. All of these ingredients were mixed together and formed into patties. We pan friend them in canola oil. Once they were finished we placed them on a plate lined with a paper towel to absorb any excess oil. I just read a great article in Cooking Light that discusses how frying can be a relatively healthy way to cook foods and may not be as bad for you as once thought if done properly. 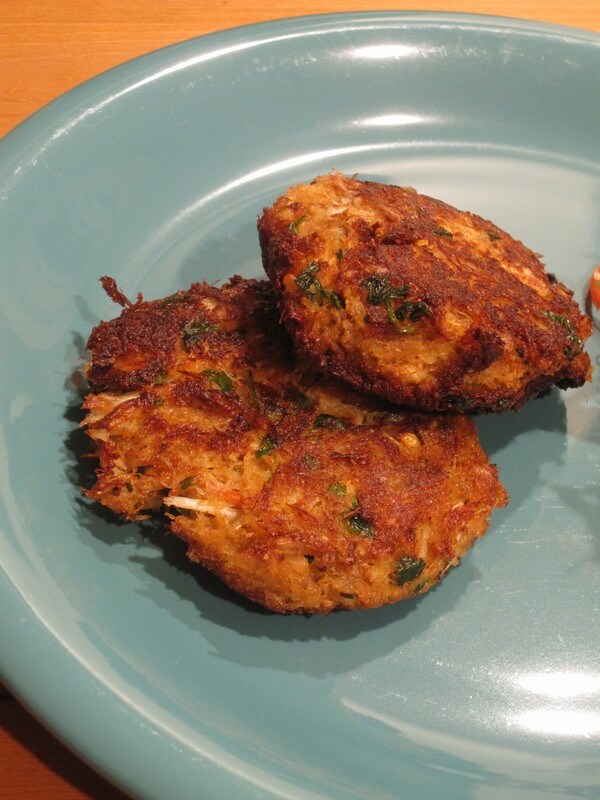 Though these crab cakes were fried, they were still very light and not greasy at all. 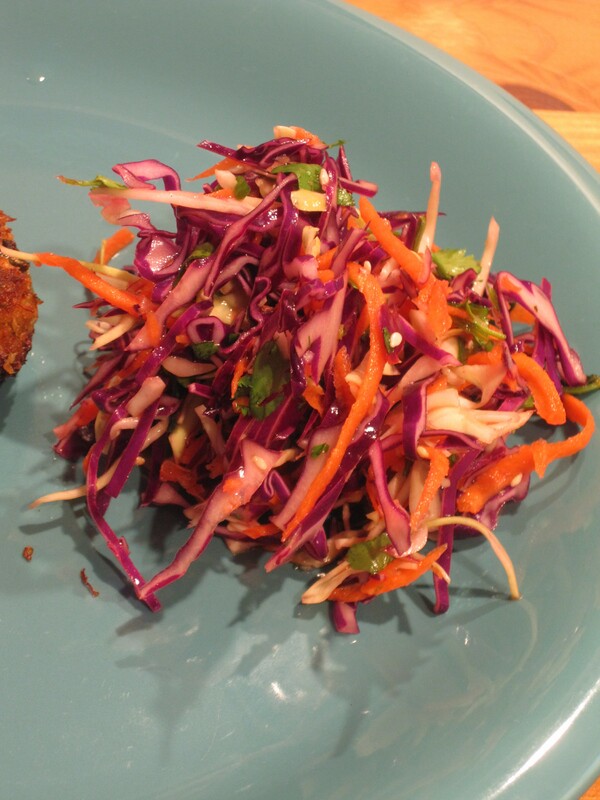 To accompany the crab cakes I made an Asian inspired slaw. I used purple and green (white?) cabbage, carrots, green onions, and cilantro. 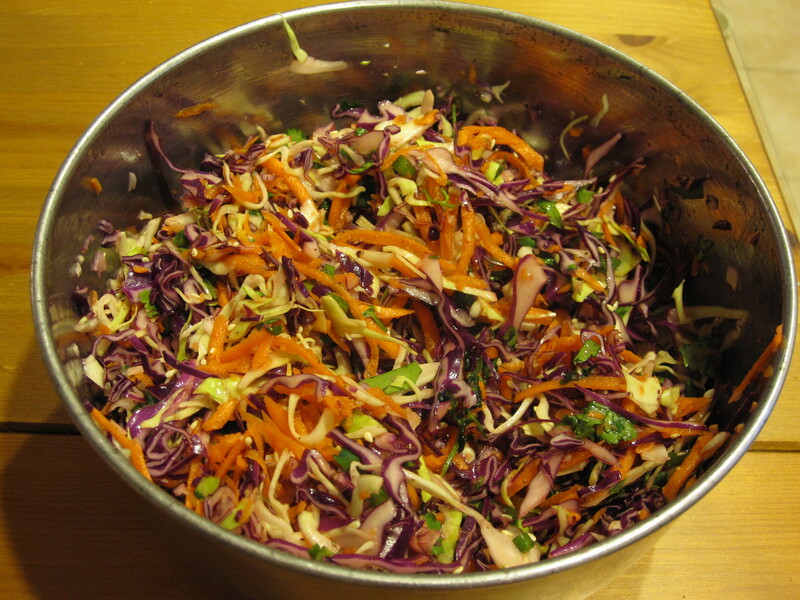 I dressed the slaw with rice wine vinegar, sesame oil, soy sauce and sesame seeds. It was light and crisp and perfectly paired with the tender cakes. When we were grocery shopping I was searching for the pre-cut cabbage but Greg encouraged me to buy the whole cabbages and use our food processor to make the slaw instead. I am so glad he did, because the outcome was so much fresher and tastier than the pre-packed cabbage. All in all, this was one of the best meals we’ve made at home in a while. 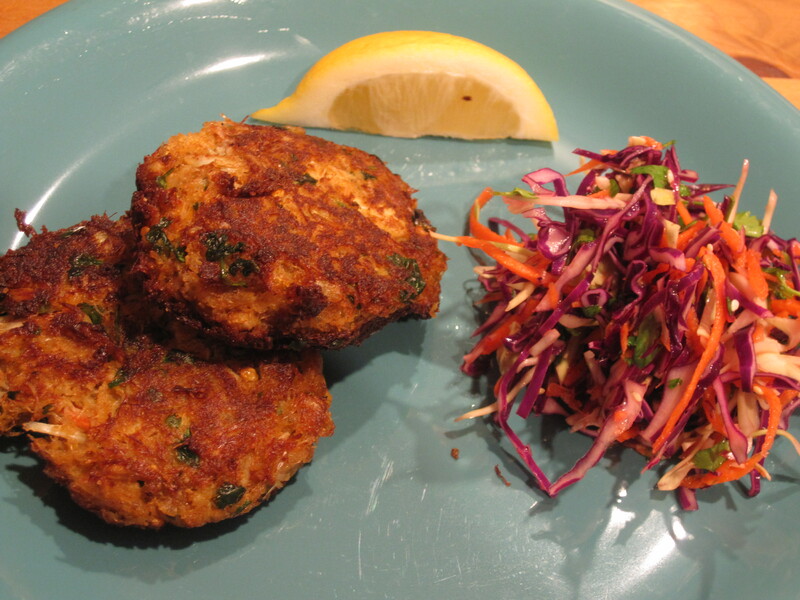 I really recommend making crab cakes at home if you are a fan of them! This entry was posted in Seafood, Sides, Uncategorized and tagged American, crab, dinner ideas, easy, low carb, low fat, quick, seafood, semi-homemade, slaw. Bookmark the permalink.